I was excited, naturally, because I haven't seen him for the longest time. My only clues of his present-day appearance were his tagged pictures in Facebook. His emails have gotten sparse since he started working in Texas. Jef was—and still is—one of my closest friends from way back in Kalayaan, the famous freshman dorm in Diliman, where probinsiyanos from all over the country are housed, partly to help each other cope with the rigors of a UP education and partly to practice Tagalog with one another. Jef was one of the reasons why I shifted from English to Molecular Biology. I'd usually go to his room, only to be intrigued by the things he was studying, particularly chemistry and biology. He was smart and sharp, and to this day, he remains one of the brightest people I know. Med school would be a breeze for him. And, boy, he loved literature and table tennis, two things I was passionate about, too. In 2005, Jef and his family migrated to the States. I was sad to see him leave, but God had other plans. My prayer then was that his life would shine for Jesus, even in America, where living as a Christian was a daily battle. Five years later, here he was. On Philippine soil. I told him I could meet him anytime, that he shouldn't worry about my schedule because my exams would always be a weekly staple, but that his presence was a rarity. I invited him over at Higher Rock on Sunday afternoon, and we had lunch with other friends from Kalayaan Christian Fellowship. It was a joy to reminisce the good ol' days. Jef told me, "Lance, tumangkad ka!" I also told him I was growing facial hair now. "Don't I just look pubertal or what?" I said. He looked more mature himself, and he spoke with a distinct twang, but he was just as clumsy. Some things never change. The next day Jef visited me at UP Manila and brought an additional surprise: JP Calleja, one of our dormmates, who's now in Law. I haven't met JP since college grad. I wanted to give them a picture of what I was busy with, so I toured them around PGH. "This is the hospital where I'll be rotating," I told them as we passed through the wards. "Welcome to the Third World." I told them that even with meager resources, we still make do. "Believe it or not, patients get better here." 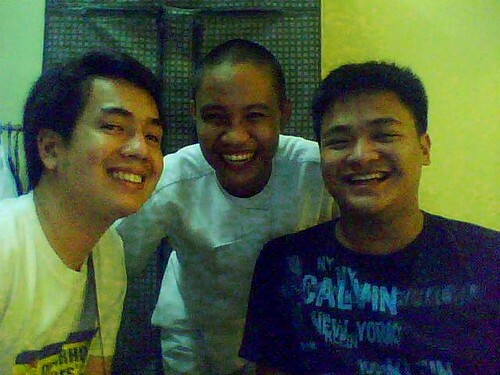 Jef treated us to dinner, then I invited them over to my apartment in Malate. On my laptop we watched a slideshow of old pictures, mostly of the Basement Boys. We were laughing like hyenas as we recalled some of the things our dormmates did. My one-year stay in Kalayaan will always be one of the best times of my life. So Jef is in the States now. I'm grateful for the chance to have met him again. Nostalgia got the better of me, so now I'm sharing old pictures of the Basement Boys, ca. 2004. This was taken after a basketball game. Basement ruled in these events. 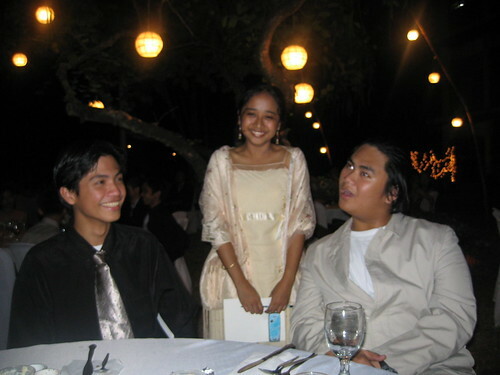 My ex-roommate Jason Enriquez (Room B17), Razel Tomacder who's now teaching in UP, and Luther Caranguian who still looks the same. 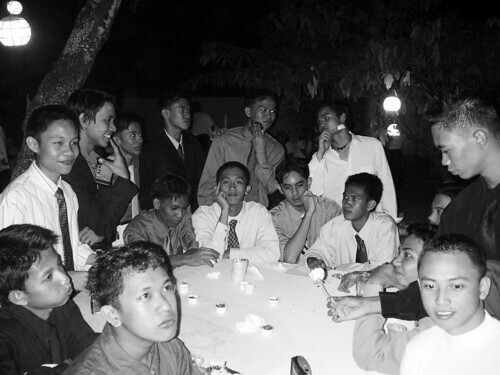 This was during the formal dinner, the one time when dorm food becomes palatable. I miss these guys. We had such great times together. If I could turn back time, I wouldn't hesitate to do Kalayaan all over again. 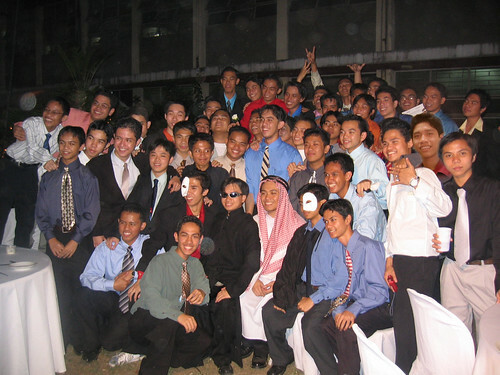 Look at the picture below, and find Mark Dave Naval's face, the one that was cut and pasted. Photoshop does wonders, until you zoom in. And five years later, here we are. JP Calleja now sports a beer belly, I still look like a sixth grader, and Jef now boasts of a 20/20 vision—thanks to LASIK surgery. Whoa!! I've been meaning to write a Kalai post too. I agree, it's one of the best periods of my UP life. I won't hesitate to do it all over, and with more experiences to boot! Sayang di ko na masyado nakakasama/nakakausap mga ka-Basement ko. Ang babata nyo pa rito!! Sobra!! Thanks for the trip down memory lane! Anjo, why not? Ang saya-saya nga ng Kalayaan. 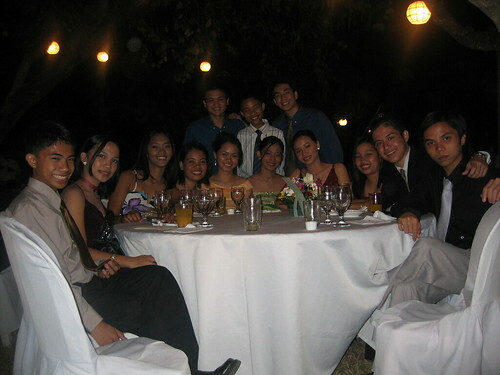 Sana makapag-reunion din kami ng batchmates ko one of these days. 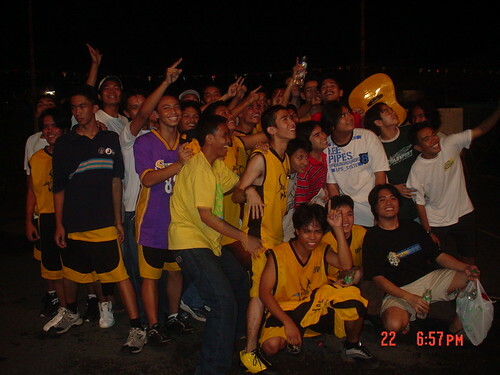 Mga totoy pa nga kami rito! Yes, may bilbil na rin JP Calleja. And, to tell you the truth, I have the anti-ageing gene. Haha. Sayang di kayo nagkita! Next time, pag bumalik ulit si Jef! Hi Razeru. I'm afraid I can't edit the comments here. You didn't age at all! How is Michiko, by the way? I hope she still remembers us. hi Lance! I really, really enjoyed spending that balmy afternoon with you and JP. thanks for that very informative and visually explicit tour of PGH that you gave us. Hehe. I'll see you again next year, ha? Jef, just make sure you inform us earlier so we can arrange for a parade at Roxas Boulevard.